The IKEA Soft Toy Drawing Competition Is Back to Bring a Child's Dream Toy to Life! Dubai, United Arab Emirates, 8 November 2018: Starting from today until 17 November, IKEA UAE will open its doors to tiny designers, aged 0 - 12, helping them manifest their dream toy, and building together the following years' SAGOSKATT collection. 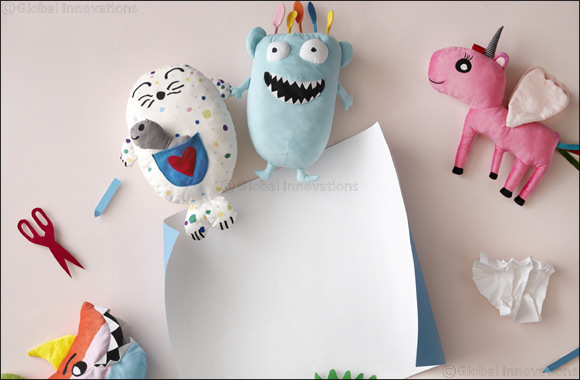 This inspired collection is a result of the annual IKEA Soft Toy drawing competition that takes place worldwide, with selected winners from across the globe. This competition will take place in IKEA Dubai Festival City, IKEA YAS Mall and IKEA Bawadi Mall Al Ain, where winners of the competition will be announced in 2019. The limited-edition collection will also be distributed across all IKEA stores. Simple drawings drafted from a child's imagination with pencil and crayon, will be sent to IKEA headquarters to be selected for production. The designs all funnel towards the “Let's Play for Change” campaign, an important initiative undertaken by IKEA to support children everywhere, in their right to play. Following a successful execution in 2017, IKEA completed the production of 10 designs shared by children from across the globe. Shane Mathew, a UAE resident, submitted his design in 2016, that was later chosen as one of the winning drawings. His vision for the perfect toy was inspired by characters from the iconic film, The Wizard of Oz. The drawing competition will encourage children to expand on their creative spirits and to translate their ideas into real designs, and IKEA is inviting everyone to take part in a memorable and creative initiative.